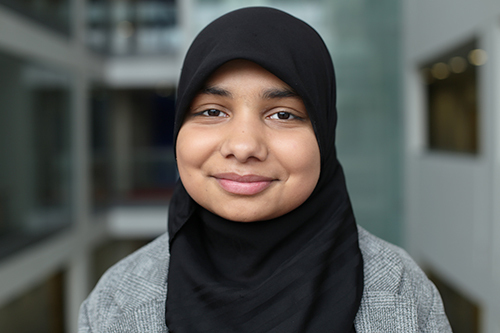 City's Economics graduate Humayra chose City as she wanted to study a numerical-based course that is applicable to the real world. There are 3 main reasons why I applied to City. Firstly, from my experience of Open Days and speaking to current students, I could sense and see this University was improving significantly. It was also clear through the high student satisfaction they receive. Secondly, the graduate prospects were very high at City, which was an important factor to me. Thirdly, I wanted to go to a University that is easy for me to commute from home. I applied to study Economics and wanted to study at a university where the content was very numerical based, practical and applicable to real world. This was one of the reason why I selected City over other universities because some universities focused more on theoretical aspects instead. I have been a Student Ambassador since I started university in 2015 and highly recommend this role. This is because it probably is one of the best chances to meet other students from various years and courses. I was also fortunate to meet students in my same course both a year older than me and younger than me, which means I could seek support with my studies and also provide support to those below me. It is also a very flexible scheme and easy to juggle with studies and fun to work at the events. I was also involved in the Islamic Society and assist in organising socials. I have also been selected as secretary for the society where my role involved taking minutes and booking rooms. Have you had the opportunity to do any internships or work experience as part of your course? I have completed an internship at Arthur J Gallagher for summer 2016 and summer 2017 as an Analytics Intern. My role involved carrying out a 6 week background research on the premium charged of top 20 insurance companies (first summer) and the automotive industry (second summer). I have also taken part in a mentoring scheme with State Street where I was matched with a Portfolio Analyst employee. This scheme was arranged with the charity organisation Brokerage. The mentoring scheme allowed me to have a number of sessions on developing interpersonal skills such as networking skills and presentation skills. There was also a business challenge at the end, which I was selected as one of the four finalist and had to present to the CEO and other senior employees of State Street. I have also attended a few insight days with Bank of America and Aviva. Choose a subject you enjoy and want to do. Study the content of the course and the structure carefully - Universities vary. Take advantage of the extracurricular activities especially the ambassador schemes – probably the best thing that exceeded my expectation of City.